the manta rays love to go there! Nelivaru Thila is about 40 minutes boat ride away. We enjoy the trip sitting on the sundeck, chatting with everyone, the boat crew teaches us some words in Dhivehi. For example, koamas are the dolphins and fulhangi the flying fish which we see jumping out of the water along the way. And after we pass 3 islands and a sandbank we are finally there. It is located on the Eastern Side of the Atoll and has several cleaning stations. One at either end of the reef and one along a sandy patch that is also the home to thousands of garden eels. It almost look like they are performing a little ballet. Nelivaru Thila is a long narrow reef, one side features a wall with overhangs and the opposite side slopes towards a sandy bottom. During this season we skip the wall and only dive the east side looking for the mantas. 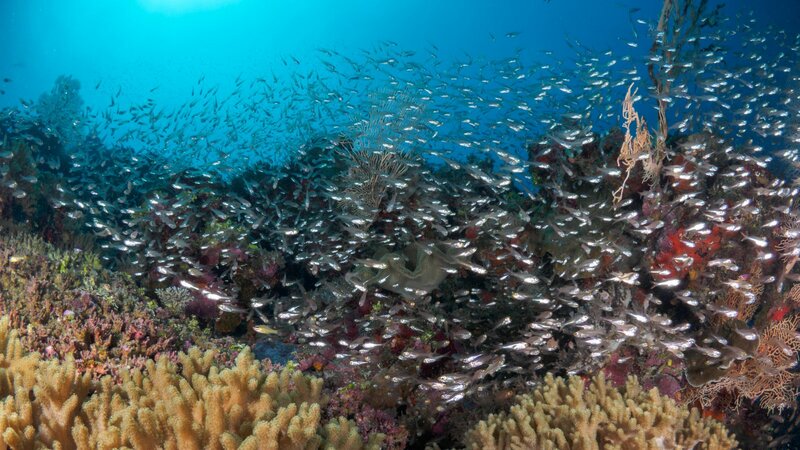 The glassfish in the canyon and schools of fusiliers in the blue keep us busy until we get to the cleaning station. One time, while waiting for the mantas, GG our PADI dive guide saw something moving in the sand and when he had a closer look it turned out to be a rare spiny leaf fish. It was pretty dark in colour so the photo didn’t turn out too good but you can see it here. 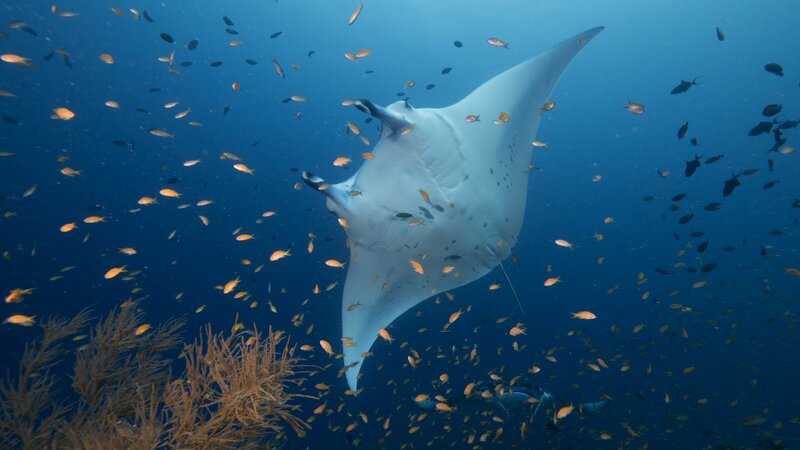 Well, and then there are the mantas that come to the cleaner stations. We kneel on the sandy bottom which makes it easy, no need to hold on or look out to not touch any corals. We can just look at the spectacle right in front of us. The cleaner wrasse get to work and nibble at the tails, gills, clean little wounds and get rid of parasites. So the mantas patiently line up and take their turns in the cleaning stations. Not seldom we run low on air and have to leave the mantas behind only to come back another day.